The 3D Connexion line of 3D mice all have one thing in common: the "cap" in the middle. This cap is what you grab onto to move about in 3D space. You can move the cap in six directions. This allows incredibly fluid and intuitive control of where you are in 3D. Within minutes of using this thing you will be flying around your models just like Superman, no phone booth or cape needed. 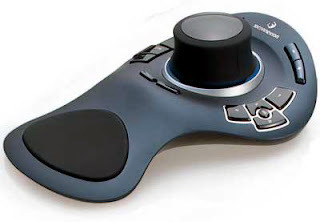 After using it for a while, you will notice that you hardly need to pick your hand up off of it when you are modeling. Your motion throughout your model is so much smoother. The way this thing gets you around really allows you to access places and get views that would normally be far more challenging. If you've ever modeled in the interior of something in Sketchup, you know that when something gets in front of your view, it's frustrating to get away from it. Usually you have to bail and do "Zoom Extents". Not with this gadget! I love this thing. It has made me faster and more efficient. It's also an excellent presentation tool because it allows you to make presentations less "herky jerky" and more smooth and immersive. Just don't try to re-create the Star Wars trench run scene unless your viewers have strong stomachs!